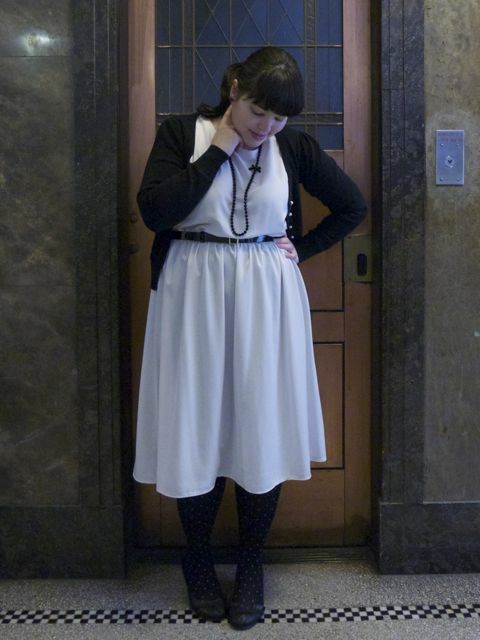 This outfit – white dress with black tights and cardigan – makes me feel a little like the negative of a photograph with the shades of dark and light reversed. Reader Jo also has this dress, and commented last time that she wears it with black tights and jacket, so I thought I’d steal her look. Doesn’t it work wonderfully? It wasn’t quite the smartest outfit to wear today – Melbourne suffered through a day of persistent misty-rain, but fortunately the opaque tights did double duty of protecting my modesty AND keeping me warm! 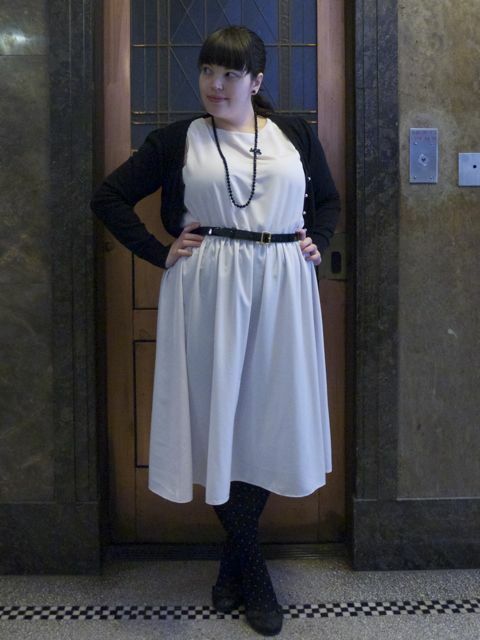 This entry was posted in Uncategorized and tagged asos, cardigan, cold, dress, friends of couture by lillipilli. Bookmark the permalink. Love the negative effect! I always feel odd wearing dark tights with light dresses – you pull it off perfectly. Thanks Rebecca! I actually tried it with sheer tights first because I thought opaques would be too much, but the outfit actually works much better with the darker colour at the bottom to balance out the cardigan. I’m so excited you gave the ‘negative’ look a go! You look totally fab 🙂 I might just have to wear my dress again today although dear old Sydney is very cold right now…so cold that I’ve been layering up as if I lived somewhere much, much colder! I love the black necklace with the outfit it really pulls it together…gorgeous necklace too. No, thank YOU for the suggestion, Jo! Hope you’re loving your new camel version of the dress, too! The look is entirely positive! Love the beads. Thanks Mitzi! I love ’em too! I’m not a huge fan of white dresses, but this one from asos is very lovely. And the Negative Look works good with your hair and type. Thanks Nadine! I always have trouble keeping white dresses clean. Fortunately this one is totally wash n wear! oh! what an awesome look, your bicycle print head band would look adorbz with this outfit 🙂 the pearl-style buttons on the cardi work soooo well. do you have a polkadot b&w cardi? it might work well too. Thanks a good idea, Estherosita! It didn’t even occur to me to wear the headband, but I will next time. LOVE how you’ve worn the dress. I still haven’t worn mine but plan to on Monday for new role day…eek! 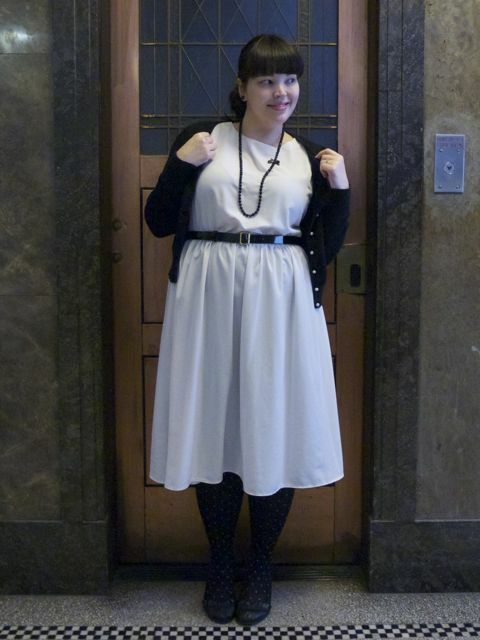 LIke Estherosita suggested I plan to wear mine with my black & white polka dot cardi – although mine is blue not white.